Jeep Cherokee pictures revealed | What Car? The first pictures of the 2013 Jeep Cherokee have been released, after they leaked online ahead of the car's unveiling later this month. 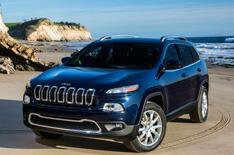 The new SUV replaces the Jeep Liberty in the USA, and it will be the first to bear the Cherokee name since 2001. There are few details available, but Jeep has said the new car will be 45% more efficient than the outgoing Liberty. Although the Liberty was not sold in the UK, a spokesman for the company confirmed that the new version will be offered in this country as a rival to the likes of the Land Rover Freelander. Jeep also claims it will offer a high level of on-road dynamics and the company's traditional off-road ability. It will be built at the company's factory in Ohio in the USA, and is expected to go on sale in autumn this year.